HISTORY OF F.Y. CORY PUBLISHERS, INC. In 1947, a year after her husband Fred Cooney died, 69-year-old Fanny Y. Cory purchased a cabin across the street from the farm where her daughter Sayre and family lived on Camano Island, WA. It was to be used as her part-time residence during the sweltering Montana summers. This cabin was originally attached to a garage further back in the woods and Grandpa George Dodgson sawed the “cabin” from the garage and moved it closer to the high bluff and built the brick fireplace. Later neighbor Bill Smith added a bedroom. While Fanny was still in Montana she corresponded with Sayre about putting in an oil furnace and a big picture window. While she was in residence at her cabin, she continued her hectic daily schedule of creating her “Sonnysayings” and “Little Miss Muffet” cartoons. Fanny moved to Camano Island permanently when her ranch near Helena, Montana was flooded in 1952. Even though her primary residence was then Camano Island, for a number of years she rented an apartment in Helena for extended periods to visit family and friends there. She continued her cartooning career from wherever she was, until the age of 79 years in 1956. Living in the more mild climate of Washington State suited Fanny. With a longer growing season she grew flower gardens as well as asparagus and other vegetables and enjoyed the apples from her fruit trees. Mostly she enjoyed her daughter Sayre and her family who lived so close and interacted with them on a daily basis. Her grandchildren fondly remember her homemade Snickerdoodle cookies and her imaginative reading of the classics to them or telling of original stories. An outgoing, social person, she made friends with her neighbors and others in the community and attended the local Episcopalian church. Modest to a fault, she never bragged about her world-wide fame and most of her friends and acquaintances did not realize the celebrity of their interesting, friendly neighbor. Even after she retired from her career of cartooning, Fanny continued to paint for enjoyment in watercolors and even tried her hand at oils. The location of her cabin overlooking Saratoga Passage toward the Olympic Mountains and views of the woods and her gardens provided her endless subject matter for her many paintings. She was a great encourager of her daughter Sayre in continuing her art education by drawing and painting and encouraged her grandchildren to paint as well. Over the years, Fanny had shown various family members, along with her other paintings, her original 26 watercolor paintings with verse that came to be known as “The Fairy Alphabet”. She had said how she always wanted to have them made into a book but because of the elaborate colors and the limitations of the printing systems of the time, she had always been told that making them into a book would be too expensive. In her later years, after her eyesight and hearing failed and she could not safely live alone, she went to live with her daughter Sayre and family in the nearby town of Stanwood. Even though she lived full-time in Stanwood, she loved to be taken out to her cabin on Camano for visits. It still contained all of her familiar things just as she had left them. In about 1968, in Fanny’s heavy, old sideboard drawer where she had stored much of her artwork over the years, mice had nibbled edges of paintings and in the bottom of that drawer, in a box with a hole nibbled in the corner, Robert and Sandra retrieved the aging but still beautiful original watercolor paintings of the “Fairy Alphabet”. In fact there was an extra “D” painting showing daffodils with girls’ faces that was painted at the same time as the other Fairy Alphabet paintings but because Fanny thought it did not fit in with the other fairies, she painted the Dryad painting to replace it (you can see this painting above). By this time, these painting were about fifty years old and although the paintings had been kept out of the light, the paper was beginning to show damage. Worrying about the fragility of the original paintings, and with the permission of Fanny and Sayre, Robert made protective sleeves for each painting, hand-press lettered each verse on its sleeve and carefully inserted each fragile painting into its protective sleeve. It became obvious to him that it would not be long before these beautiful paintings would be destroyed and lost to posterity. Also there were discussions of what would happen to the Fairy Alphabet originals when Fanny was gone. Some family members thought they should be divided among family members. Thinking about what Fanny had said about her desire to have them made into a book and given Fanny’s advanced age and hoping to get a book published while she was still living and while the originals were still together, Robert and Sandra began to brainstorm as to how to get published this work Fanny had so lovingly created. With modern printing techniques maybe it would be possible to have them finally made into a book. Thinking that anyone who saw this artwork would be anxious to publish it, with Fanny and Sayre’s blessing, Robert photographed each painting and Sandra agreed to hand carry the photographs and pitch them to a publisher when she was in New York in route to Europe in 1969. She had already researched how to get a publisher and had corresponded with many of them to no avail. It was not lost on 26-year-old Sandra when she arrived at Grand Central Station, having traveled across Canada and down to New York City by train, and clutching the photos of “The Fairy Alphabet” in her hand, that she was about to embark on the same path Fanny had taken to see a publisher when she was only 18 or 19 years old. With her bags stored in a locker at Grand Central Station, Sandra called a taxi, handed the driver a piece of paper on which she had written the address of the publisher and sat nervously on the edge of her seat as the taxi headed for the derelict Bowery district. She was more than a little apprehensive when the taxi stopped on a deserted city block and the driver pointed to an old tall, dark building. Sandra exited the cab, paid the fare and headed to the flight of stairs leading up to a big, heavy door. She couldn’t decide whether she wanted the door to be locked or not. If it were locked, she could retreat to the cab that was still waiting below and escape this scary adventure. The door was unlocked, however, and she entered into a dark, cool vestibule with another flight of iron steps, steeply ascending to a higher floor. It was totally quiet and Sandra could hear her footfalls on the iron steps that were worn in the center from so many hopeful souls having traversed them over the years. And they were slippery! Sandra thought of Fanny’s story about her coming to see this same publisher (Harpers?) to get started as a commercial illustrator and realized that she was now putting her feet in the same footprints previous made by Fanny about 70 years earlier. From what she could see, the building seemed deserted but when she reached the higher floor, there was a door with the name of the publishing company lettered on its translucent window. As she had prearranged, she met with the publisher and showed him the photographs of the paintings.. She presented all the reasons he should publish the Fairy Alphabet book not the least of which that his company had published her work in the past. Recognizing Sandra’s naiveté, the publisher kindly explained some of the facts of publishing to her. The biggest stumbling block the family was going to encounter, he said, was the fact that there was no single authority to deal with the publisher. They would need the owner of the material to work with or if not the owner, than whosoever the owner gave such authority to. Also, the age of Fanny being by then 91 years old was a problem for a publisher who would worry there could be some disruption during the publication process. If Fanny were to give authority to someone else, it needed to be in a legal document, naming also a third person who would then have authority to speak for the owner. Sayre was then about 62 years old which the publisher said was also too old to be the sole entity.. “What about you?” he asked Sandra. He explained that having a young person with the authority to sign contracts and negotiate conditions would be an advantage in getting the book published. When Sandra pushed for some commitment by the publisher that if she got all of his suggestions implemented, that he would be interested in publishing the book, he politely declined. It was not the kind of book that would fit in with their current list of published works he said. It was a discouraging setback and nothing further was done with the Fairy Alphabet for a few years more. In 1972, Fanny died at the home of her daughter, Sayre, and was taken back to Helena, MT, to be buried beside her husband Fred in the Cooney family plot. Fanny’s house and all her possessions including her paintings were inherited by her daughter Sayre. In late 1972, Sayre sold her mother’s cabin and property on Camano Island, WA, to her son, Fanny Y. Cory’s grandson, Robert George Dodgson, and his wife Sandra. Because the house was still full of Fanny’s belongings, Robert and Sandra began to pack them up and transport them to Sayre’s house in Stanwood. There had been so many years where no one had lived in the house that the mice had taken over. There was a mouse nest in the back of the stove and at night, little mouse feet could be heard scurrying across the linoleum floor. Although Robert was a full-time and then some, self-employed designer, marketer and builder of model sailplane kits that enjoyed international distribution, he began to immediately remodel Fanny’s 630 square foot cabin of three rooms into a two-bedroom house with separate kitchen, dining room, living room, bathroom and utility room. Their daughter, Heather, was two years old when they moved from their houseboat on Lake Union in Seattle to “Montana Beach” on Camano Island. Their second daughter, Megan was born in August of 1974. The opportunity to have the “Fairy Alphabet” published in Fanny’s lifetime had been missed but living in her house, surrounded by memories of her life there and some of the scenery that inspired so many of her paintings, once again encouraged Robert and Sandra to consider how they could get the “Fairy Alphabet” published. Sandra had seen first hand that her father and aunt had formed a family corporation to handle the real estate and orchards they inherited from their mother. Also she had worked in law offices and experienced handling corporate documents and maintaining corporations and was also aware of liability issues of businesses and corporations. The idea of forming a family corporation to publish the “Fairy Alphabet” was starting to take shape. Sayre repeatedly voiced her great desire to have “the Fairies” published in a book. Having inherited the original paintings from her mother, she offered to give them to the corporation so that they could be made into a book as her mother had always wanted. 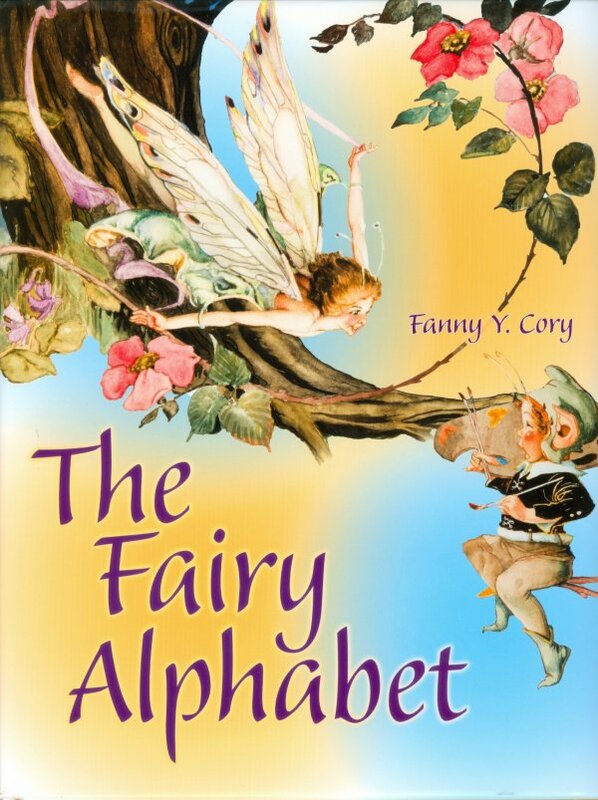 After Robert and Sandra talked to Sayre and her husband Tom and Sayre’s brother Bob Cooney and his wife Carol, it was decided that the family of Fanny Y. Cory Cooney should form a corporation and act as the publisher to get the “Fairy Alphabet” made into a book. Sayre’s other family members as well as her brother Ted and wife Virginia were invited to join in the venture but they all declined. A lawyer was hired to draw up the legal documents to create the corporation. F. Y. Cory Publishers, Inc. (The Corporation) is a Washington Corporation, formed in July 1976 by Sayre and Tom Dodgson, Bob and Carol Cooney and Robert and Sandra Dodgson. The Corporation was formed for the purpose of getting published the Fairy Alphabet by F. Y. Cory in book form. To accomplish that end, The Corporation self-published the paintings as 4” x 5” cards and as 8” x 10” art prints to increase interest in the prospective book and to bring some income to The Corporation to meet its expenses. The cards and pictures were printed by Craftsmen Press near the south end of Lake Union in Seattle. Robert and Sandra supervised the process, giving approval at various steps. Each printing could do four designs of the large size and four copies each of the same four designs of the cards. The Corporation got a total of twenty four designs of the twenty six printed. The Shareholders above named each contributed $2,000 to get The Corporation started. Later, different Shareholders loaned money for various printings. After enough product was sold, all the Shareholders were reimbursed with interest for their initial investment and all their loans. In 1986, Robert, Sandra, Heather and Megan moved from Camano Island to Bothell, WA. The official address of The Corporation is therefore: 21230 Damson Road, Bothell, WA, and Phone Number is 425-776-8067. It is crucial to keep the Montana Historical Society apprised of the current address of The Corporation so as to avoid their automatic trigger of taking of property if they cannot contact the “owner”. The Secretary of The Corporation, therefore, confirms with them annually the current official corporation address and phone number. No one in The Corporation received money for all the work they did on behalf of The Corporation through the years. It was an organization driven by the shared desire to see the artist's work published in a book. The only expenses paid by the corporation were taxes (sales and corporate/annual report/license), storing the original paintings and printing costs, envelopes, plastic card packets and other materials sold for income as well as some postage to mail correspondence and product. The Corporation has not paid for storage of product since the date of inception nor gas money for sales trips to promote its products to individual shops nor gift show fees of thousands of dollars. Members of The Corporation always paid for expenses individually or volunteered their own time and energy: Sandra kept the records and met the legal requirements of meetings, minutes and the annual report. She and Robert manned gift show booths in Seattle and San Francisco and paid all the attendant costs themselves. Carol personally visited shops in Helena and got orders and reorders. Bob and Carol's acquaintances at the Montana Historical Society stored the original art for many years in a heat and humidity controlled vault at no cost to The Corporation and ultimately published the first book of the Fairy Alphabet in 1991. They paid a royalty to The Corporation for each book they sold. Over the years since the founding of F. Y. Cory Publishers, Inc., The Corporation has made additional income by licensing some of the designs of the “Fairy Alphabet” to be made into puzzles and quilt squares to name a couple products. A second book of the “Fairy Alphabet” was published in 2011 by Riverbend Publishing and The Corporation was paid a royalty for each book Riverbend sold. The original six shareholders, all of whom were also directors, traveled to attend the corporate annual meetings. It was also a good time to see family and visit. Often Bob and Carol Cooney came from Helena, MT, to Camano Island or sometimes Robert and Sandra with their family would travel to Helena. For the meeting after Tom’s death, Sayre traveled with Robert and Sandra and family for the annual corporate meeting which was held in Helena. Occasionally the corporation paid for dinner at a nice restaurant for the directors after the meeting. Usually the family who hosted the meeting provided dinner. In later years when neither Sayre nor Carol were able to travel, meetings were held by Consent In Lieu of Meeting where everybody signed off on the corporate actions taken or to be taken. Whereas F. Y. Cory Publishers, Inc. had six stockholders when it was formed in 1976, through death and inheritance there are fifteen stockholders forty-one years later. The sole asset of The Corporation remains the original 26- watercolor paintings by F. Y. Cory and the licensing rights of those paintings. The aging note cards, 8” x 10” prints and their envelopes and plastic packet holders were divided up among the shareholders in 2013. The first book published is no longer in print and is now a collector’s item. The second book can be purchased through The Corporation or other outlets. Robert Dodgson created, pays for and maintains an F. Y. Cory Publishers, Inc. website online at fycory.com.